This highly polished silver-tone open face slim pocket watch is the perfect addition to anyone's timepiece collection. 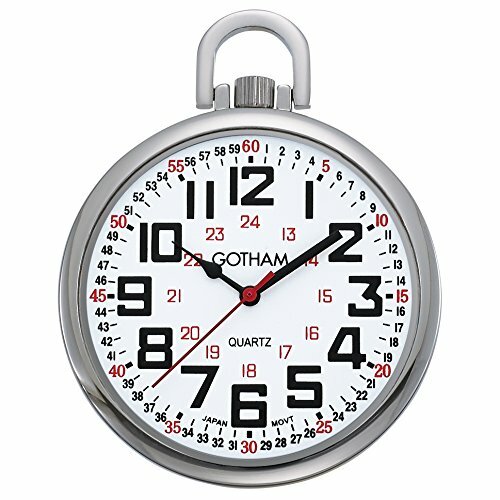 Features include a bright white classic railroad style dial with black numbers, detailed 24 hour inner track plus outer seconds track. The precision Japanese quartz movement never needs winding so you will always be on time. Also included is a 14 inch deluxe curb link chain with belt clip attachment. Arrives in an attractive draw spring pouch then boxed in gift packaging that does not need wrapping. Includes operating instructions and lifetime warranty.